JUSTIN’S PICK :: Some weeks, doing a staff pick can be pretty tough. I mean, I know there are homeless and starving people in the world, but do THEY have to sift a SINGLE comic book – out of hundreds – to highlight on a weekly basis? NO. Clearly, my plight is underrated. Taking a cue from our man Phil, I’m just going to babble about a few things that’ve struck my fancy of late. We’ll call this the Southern Variation, since that’s an appropriately nerdy in-joke one out of ten of you will understand. 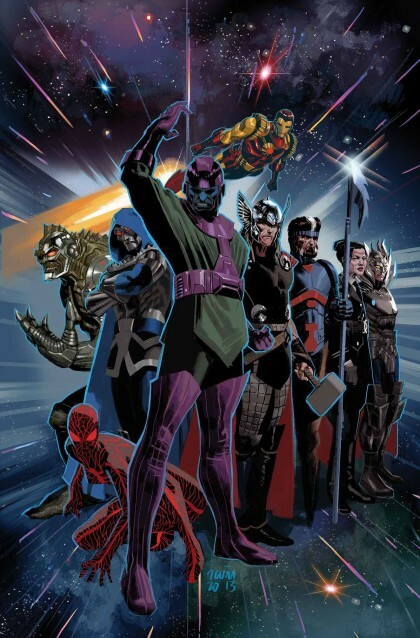 First of all, Uncanny Avengers. This is my favorite Marvel comic going right now (but it better watch its back, She-Hulk’s creeping up fast). Rick Remender packs more into a single issue than most writers manage to squeeze into a trade paperback. The pacing can be pretty glacial, and he wanders off on a lot of tangents, but man, are they good tangents. Remender is one of those guys that really understands the synthesis of plot and characterization, and how crucial that alchemy is to comics. Too many of his contemporaries seem to sacrifice one for the other, and it makes for some pretty boring and/or predictable comics. Of course, having Daniel Acuña illustrate your scripts is never collateral damage, and this guy’s stuff just gets better and better. I liken his artistic development to whittling: the more he shaves off, the more beauty is revealed. Uncanny Avengers #16 is part two of a big denouement for the series – Avenge the Earth – and even though the involvement of Kang makes any incident inherently undoable, it’s about the trip, not the destination. 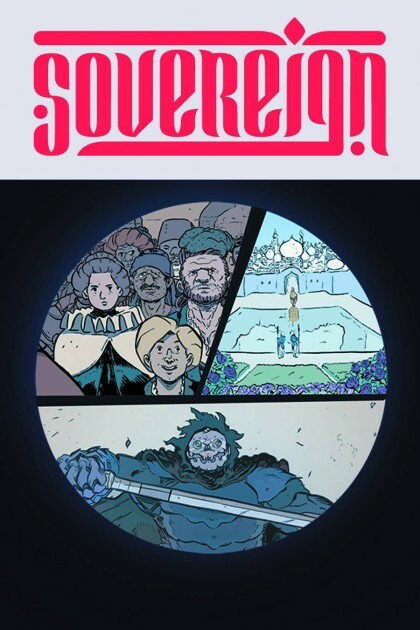 If you’d like to take a different trip, why not visit the fantastical land featured in Chris Roberson and Paul Maybury’s new Image sword and sorcery series, Sovereign? Issue two is out this week; #1 teased just enough to really whet the imagination. Understandably, it concerned itself more with exposition and conceptualizing, but hinted at broad enough conflicts to fuel this title for some time. The focus is split between a few different classes: religious, royal, and warrior, and an underlying sense of dread informs the whole issue. This is an obvious choice for fans of Saga or Game of Thrones, and the art! Paul Maybury is consistently overlooked as a reliable and deft storyteller. The guy deserves more eyes on his stuff. Provide a pair, won’t you? Lastly, my generation will not permit the publication of a Simpsons one-shot without at least a passing remark. After the likes of Mr. Burns, Professor Frink, and even Lisa Simpson have proven to be shining solo stars, who could warrant the treatment next? Moe Szyslak? Bumblebee Man? The Captial City Goofball? Close, but no cigar! 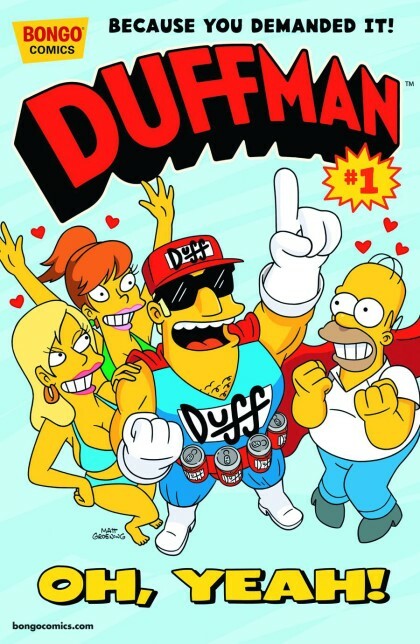 It’s the one, the only…DUFFMAN! That’s right, Springfield’s resident swill shill is ready for Spring Break with an issue of his very own comics magazine! What shenanigans may ensue are anyone’s guess, but here’s hoping the Seven Duffs show up (“Surly only looks after one guy: Surly.”). I suppose for this particular issue, we’ll have to move back to the former genre rack residency…but then again, what 80s kid didn’t adore Spuds MacKenzie? Alas, those were different, heady times. Welp, that’s the top of the heap for me this week. Good night, and good luck. See you in the funnypages. Etc.